Fort Stanton is located in a remote part of New Mexico, 35 miles north of Ruidoso. It was established by the Army in 1855 to protect Hispanic settlements along the Rio Bonito from Apache raids. After a colorful history involving the Civil War, Kit Carson, Billy the Kid and other notables the fort was decommissioned by the Army in 1896. In 1899 it was transferred to the United States Public Health Service to be used for a tuberculosis sanatorium for men from the Merchant Marine, Coast Guard and Navy. 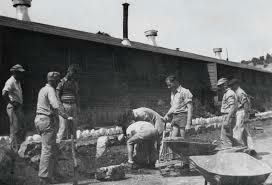 Later other internees were brought to Ft. Stanton, both German and Japanese. Some historians believe that many of the men sent to Ft. Stanton during this time, had, for some reason, been branded as troublemakers and were therefore sent here to be “segregated” from the rest of the internee population. Security at Ft. Stanton was said to be the most stringent of any of the internment camps. SS Columbus sailors garden-Ft. Stanton, N.M.